(indefinite inflorescence) An inflorescence in which meristematic activity continues at the apex of the main stem and primary laterals and flowers are developed from the axillary meristems. The inflorescence is often pyramidal in shape with older flowers at the base or, in the case of a flat-topped arrangement, on the outside. 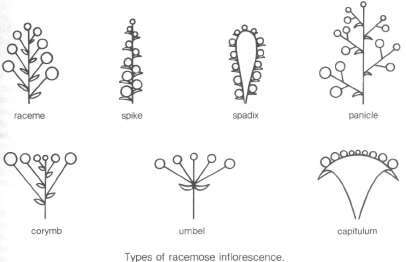 Different types of racemose inflorescence include the *capitulum , *corymb , *panicle , * raceme , *spadix , * spike , and * umbel (see diagram). Compare cymose inflorescence.